This NAS (North America Specification) Defender 110 Station Wagon has come to us from New Jersey. The 110 has had a lot of use and a number of poor repairs, including rear accident damage, an engine that seems to have coolant issues and more. The good news is that the 110 will be getting a new R380 gearbox and a galvanized frame so most of those issues will be taken care of in one fell swoop. We'll also be installing some of our stainless steel products and getting the 110 back into shape so the owner can enjoy it again. The first step is to go over the 110 and make a list of problems, and then forward that to the customer. We call it an evaluation. From that list the customer can pick what he/she does and does not want done. The next order of business is to remove the body from the frame. In the image above you can see that we have disconnected everything, removed all the fluids and have installed our support jigs so that we can lift the entire body of the 110 off the chassis, without taking it apart. This image shows the body of the 110 starting to be lifted away from the chassis and running gear. This saves hundreds of man hours, and many parts, and will allow us to quickly set up the new galvanized chassis and the new Stage II suspension system. The 110 will also be getting numerous upgrades such as a full NRP stainless exhaust system, new tires and much more. Here you can see the body of the 110 separated from the running gear. The body stays together and will remain like this until the new chassis and turbo diesel running gear are set up on the new galvanized frame. 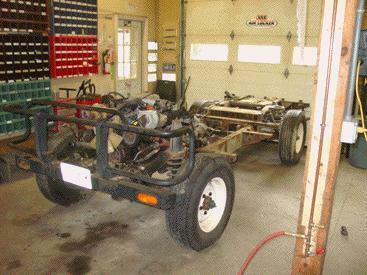 This image shows the original chassis and V8 EFI running gear removed from the 110. 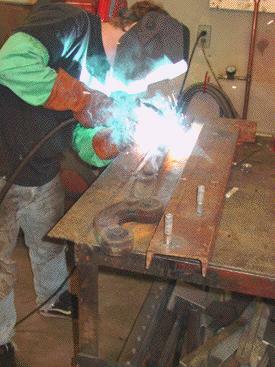 At this stage the running gear will be removed from this chassis and what will be crossing over to the new galvanized chassis will be inspected and then assembled on the new galvanized frame. 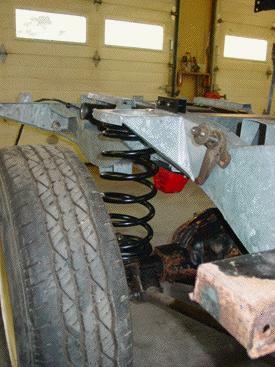 As the suspension and axles come off the old chassis, the modifications required for the Stage II suspension are completed. Above you can see one of the ECR fabricators converting the stock front radius arm into a Stage II/III radius arm. Making these corrections to the suspension geometry is crucial for a lifted Defender that handles well on the highway and is still very capable off road. If you just install the springs you will get driveline noise and a twitchy, ill handling Rover, and nobody wants that. 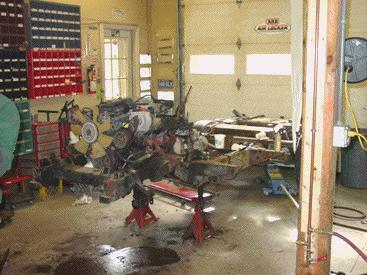 Here you can see the axles have been removed from the chassis and all the running gear will be next. While everything is stripped down it is time to address some upgrades that the customer has in mind. Above you can see the front axle of the 110. Unfortunately the NAS Defender 110s all came through with a 10 spline front axle. These are good for on road use, but too weak for off road and locked applications. 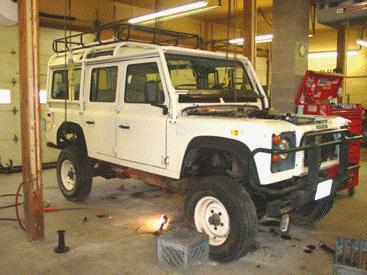 To cure this weakness we will be upgrading the guts of the front axle with an ARB lockers and a full 24 spline conversion with heavy duty CV joints. 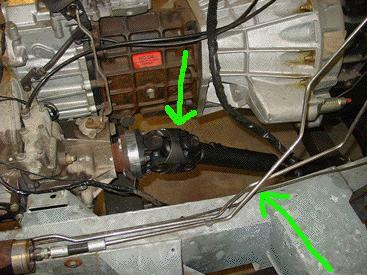 This image shows the front differential has been removed and a 24 spline ARB air locker has been installed in place of the 10 spline open differential. For information on the 24 spline heavy duty upgrade for a 10 spline axle go here! 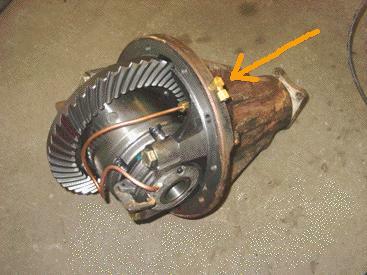 The orange arrow also points out ECR's exclusive air line install. This set up allows you to service all the external air line fittings without ever needing to take the diff out. 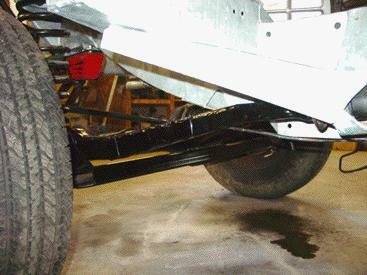 Our exclusive fittings also direct the air lone directly down the axle (not up like the standard ARB fittings) to keep your air lines from debris damage under the vehicle. These exclusive tricks come from ECR's extensive off road background and real world tests. 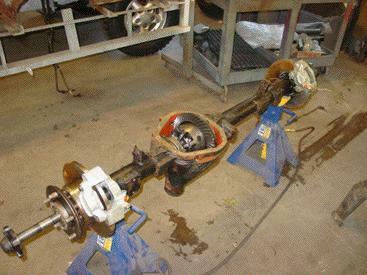 In the rear axle of the 110 we are making a lot of changes. 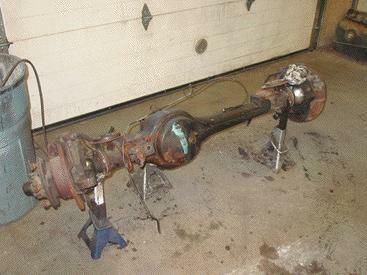 We have swapped out the entire rear axle assembly in favor of this later model 110 rear Salisbury axle that has rear disc brakes. 1993 NAS 110s came in with rear drum brakes. These will give the 110 better stopping power and the disc brakes are easier to service in the future. We will also be upgrading the rear differential with an ARB air locker to give the 110 the most traction available with front and rear lockers engaged when the going gets really tough. 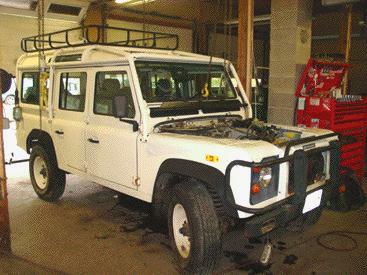 As work continues to get the axles, axle upgrades and ARB locker installs, the running gear also is being assembled. 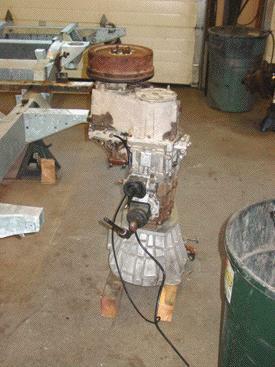 The image above shows that the V8 5 speed gearbox has been removed and the new version has been installed onto the 1.4 ratio LT230 transfer case. This unit is now ready to mate to the engine in the new galvanized frame. This 110 is also getting a number of ECR ROX off road upgrades. A new ECR ROX tie rod guard has been fabricated for the Defender and you can see it here in our paint booth getting epoxy primed. Once primed with 3 coats of primer it will be painted in satin black and then installed to fully protect the Rover's tie rod from harm when off roading. 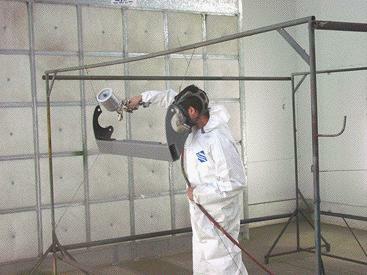 The heavy duty drag link and Stage II/III radius arms that were fabricated earlier are all being painted at the same time so that rolling chassis assembly can be quick and efficient. This customer, like all ECR customers, had to wait patiently in line for us to get to his project. As you can see form this web page the process is not slow, but the wait times to get to this point are long, as we have so many projects to do. According to the customer, his buddies were giving him a lot of grief about waiting so long for his dream 110, telling him it would never be worked on. Well who is laughing now! They'll shut their jealous traps and move their Honda's to the curb when this killer Stage II lifted and locked Defender 110 rolls up in their rear view mirror. Now that the HD Salisbury rear disc brake axle has been set up with the rear ARB air locker, it has been installed onto the rolling chassis. The Stage II suspension set up has also been installed with the correct springs, longer bump stops and soon to come Fox Racing shocks. In the front of the 110 we have also installed the Stage II suspension, along with the ECR ROX revised radius arms, now fully epoxy primed and painted. We have also installed the ECR ROX tie rod guard and mated the new 24 spline ARB locker to the front axle case. 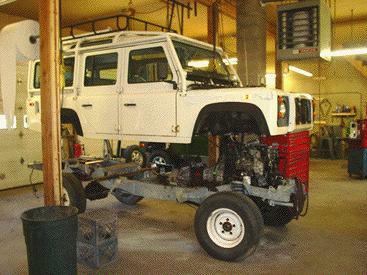 Here you can see the new galvanized chassis, fully set up and Stage II suspension nearly ready to mate back to the body. We still need to run the new stainless steel fuel lines and do a few other work orders, and then we will reinstall the 110's body. 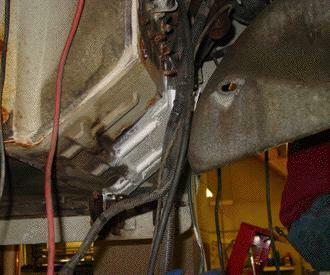 While the 110's body is lifted off the chassis we have to address some of the rust issues on the bulkhead. Above you can see the drivers footwell of the 110, it has some serious rust issues. We have removed the inner fender to access the bulkhead and we will now cut out this entire section to get back to good metal, and install new steel as a patch for the rust holes into the cabin on this 110. The complete cure for this type of problem is an ECR treated and prepared new bulkhead, but short of that, a few correctly done patches will help the 110 last longer before it will need to have bodywork some years down the line. 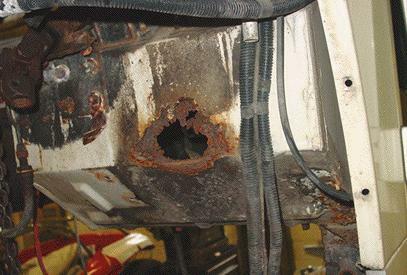 Here you can see that the large rust holes in the bulkhead have been repaired and at this stage the body of the 110 is ready to be mated to the new galvanized chassis. The chassis of the 110 has been fully set up for long life by being galvanized, and to help the fuel system last a long time we have installed a set of our stainless steel CNC made fuel lines. These lines are a great way to replace those rusted fuel lines. We have also finished up the suspension and drivetrain installation with the body off, getting the Earl's Plumbing longer stainless steel brake flex lines installed, and adding CV driveshafts front and rear for smooth vibration free road trips in this 110, even with the lift kit. With as much work as possible done on the chassis and drivetrain, we have now mated the old body and the new chassis/drivetrain together. 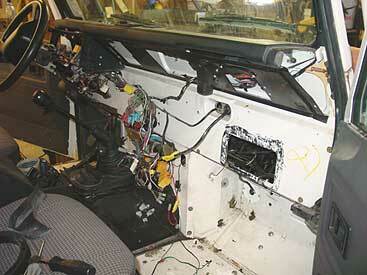 Now it is time to get all the body set up and fully installed and start to do the wiring and other needed work. You will also notice that we have finished up the front axle upgrades, adding HD CV joints, with custom 24 spline axles and a 24 spline ARB air locker to make the front axle of the 110 tough as nails. This 110 now runs the same set up we run on our D90 with 35" tires, ECR 4, it will make the 110 front end nearly bulletproof as it will be running smaller tires. 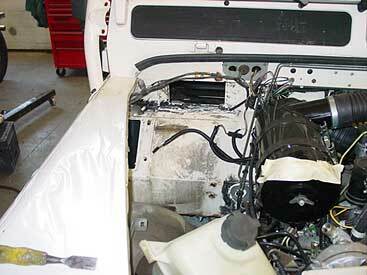 To feed air to the engine we added a raised air intake. We start out with a Mantec system and then modify it to fit the NAS 110. 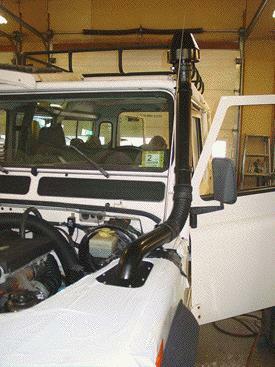 This set up will allow the 110 to wade in deep water if need be, as the diesel has no problem with deep water, and a raised air intake always looks great on a Defender, especially when it is fully functional like on this 110. The quality of an ECR engine conversion can be found in the details, not only do we use only new parts for the conversion, we also convert all the small details. Above you can see the dash of the 110. 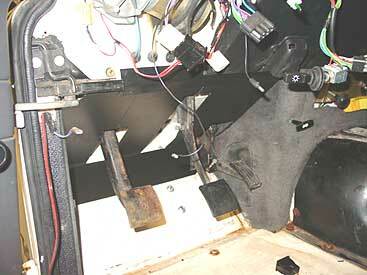 We have installed the correct diesel warning light pod, or binnacle, that has all the correct lights for the engine. We also have installed the correct fuel gauge. The factory fuel gauge in an NAS 110 clearly reads "unleaded fuel only", so this change helps to assure that no driver ever puts the wrong fuel into the 110's fuel tank. One of the aspects of this 110 that was damaged was the HVAC system. That stands for Heating, Ventilation and Air Conditioning. 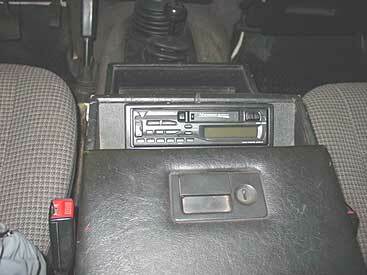 The HVAC system in a 1993 was lame the day it was new, and in some way Land Rover must have known this. They stopped making a good number of the needed replacement parts to keep the systems going a long time ago. So what do you do when you want good AC, good heat and parts that will be available long term? Unfortunately you do what you see in the image above, you gut the factory system and install modern Defender equipment. As you can see above we have removed the dash system with its over complicated air ducts and we are back down to the bulkhead. In the engine bay the same thing happens. All of the HVAC system parts are removed to get ready for the late model heat and AC system. Here you can see that we have removed the heater matrix and now we'll make the minor modifications to the bulkhead, clean the area and get ready to install the new parts. 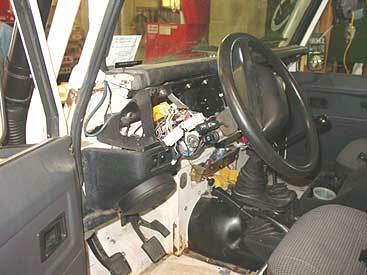 This image shows the dash area, with all the needed parts removed. The new system will be easy to operate and last longer, as it is simple and robust. Our AC systems come directly from the guys who make them for Land Rover, so everything is a simple bolt in and belongs in your Defender. The system is also fully supported by Land Rover and that means you won't have trouble with replacement parts in the future. The new HVAC system also opens up new options like a complete rear AC system and more. It is better for the environment as well because it is an R134a system (less harm to the ozone layer). On the exterior of the 110 we are installing some upgrades as well. 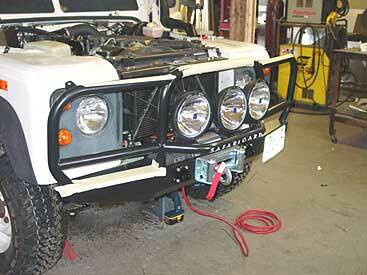 Here you can see that we have installed a new Safari Gard front bumper along with a Warn 9000 winch. The bumper is topped off with 3 Hella 4000 lights to turn night into day while off roading. 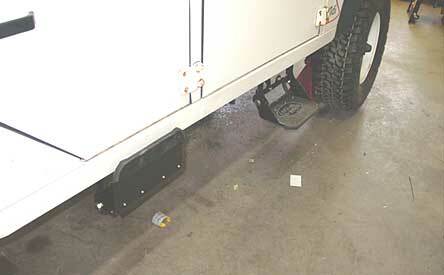 We also added a set of ECR ROX recovery points to add flexibility to the customers winching needs. At the side of the 110 we removed the rusted NAS running boards hand have installed a set of 4 side steps to make it easier for the kids to get in and out of the 110. 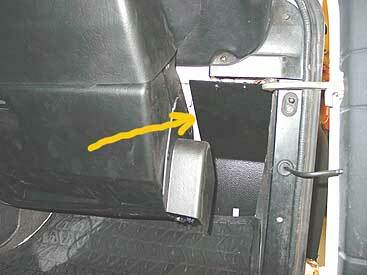 The side steps flip and fold to be down for easy access, or flipped up out of the way. 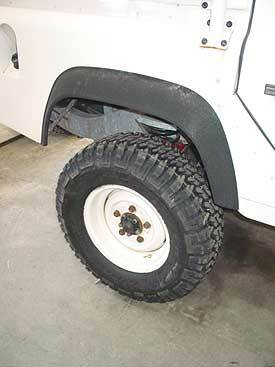 To meet our customers requirements on the pavement, and the dirt, we have installed a set of Good Year MTR tires. These tires are great on the street and they do quite well of road as well. They are a great dual purpose tire, and they make the 110 look so much better than the skinny street meats that it arrived with. Inside the 110 the upgrades continue. Above you can see that we have removed the floppy cardboard footwell trim (that was held in by duct tape) and we have installed a set of ECR ROX heavy duty footwell trims. This heavy duty, lined, alloy panel will stand up to muddy boots, kicking and just about anything else, and it will stay in place and keep its shape. It looks like the factory piece, but it performs 100 times better. New foot pedal pads are on the way for the 110 as well. As with most 110s, this 110 had seen its share of really poor past repairs over the last decade plus, especially to the wiring behind the dash. We dug in and fixed all the wiring glitches and corrected everything with the correct wire color codes and correct wire sizes. Now everything in the 110 works as it should. The new updated dash still retains all the functions of the original dash, the clock and other gauges are now mounted securely in the lower dash, and the controls for the heated windscreen and rear wiper are located in the new upper dash panel. The new AC system has also been install in the passenger footwell and all new controls for these systems have been installed. Once the AC has been installed, you can see it here being test fitted, the small details of the dash will be installed to give the 110 ice cold AC, good heat and defrost all with readily available parts and easy to service controls. It may not be original NAS Defender 110, but it works better and still looks very factory... then again what is factory about a NAS 110 with a 300 Tdi! 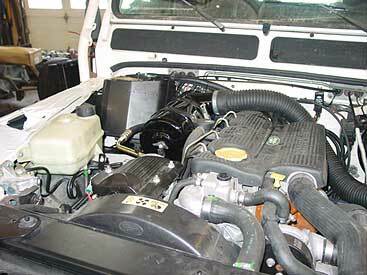 In the engine bay you can see the changes and updates for the new HVAC system. The new heater matrix has been installed on the bulkhead and new AC lines and heater controls have been installed as well. This new HVAC system makes things much simpler and easier to service than the 1993 HVAC system. 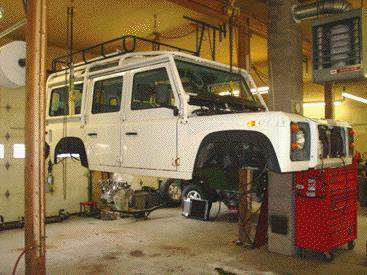 To help out with off road recovery duties we have installed a new Hi-Lift jack and mounted it to the 110. 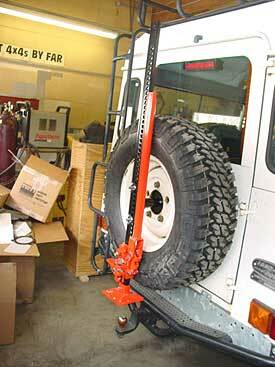 These can be used as a winch, a jack and have are a great tool for off roading. 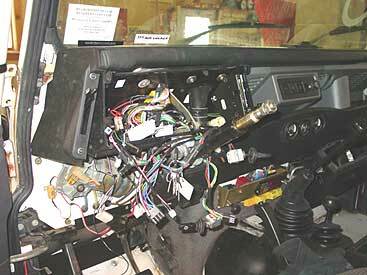 Inside the 110 we have installed modest sound system to replace the broken aftermarket unit that was in the Rover. 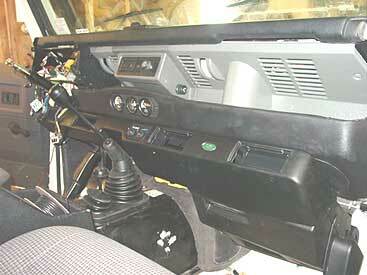 To get some better sound we have moved the speakers from the dash to the door panels. Moving the speaker allows you to change from a 4" speaker to a larger speaker, for better sound. Here you can see the 6" Infinity speakers that we have installed in the front of the 110. 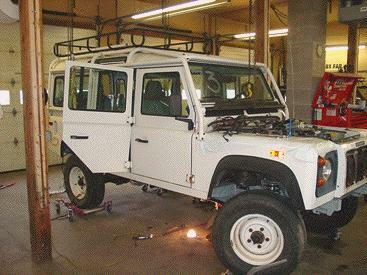 One of the things that sets an ECR built Defender apart is the switch gear we use. In most shops they stuff goofy radio shack switches all over your nice original interior. Here at ECR we only use correct fitting and looking switches to retain a factory look, even with add on equipment. The arrow on the LH side points to the master arm switch for the ARB air compressor, nicely tucked away in a factory location. 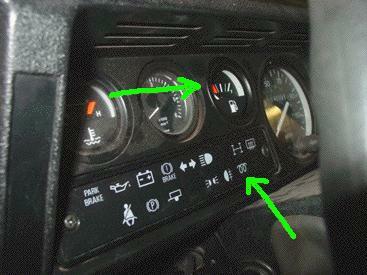 The RH arrow points to the Aux #2 lamp switch that controls the 3 Hella 4000 lights. The switch is illuminated with the #2 lighting logo so that it looks factory and it fits the wiper motor cover perfectly. 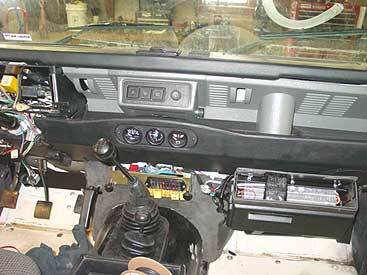 On the other side of the steering column we have installed another factory type switch to control the ARB lockers. 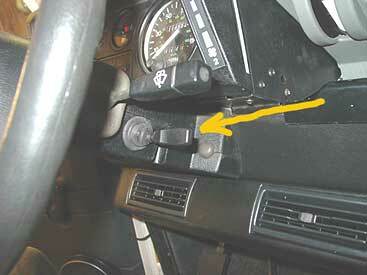 Pull the lever toward you one click and you engage the rear locker, another click gets you the front and rear locker. The switch is mounted in another factory location for a clean look. It is easy to reach while off roading and doesn't scream "add on" even though it is controlling something that a 110 never had from the factory. Functional, clean and simple, only from ECR. Now that the AC system has been installed and tested, we turned our attention to making it look finished. The arrow above points to a small kick panel that we made to cover up the visible portions of the bulkhead to the right of the AC system. This gives the install a more finished look. 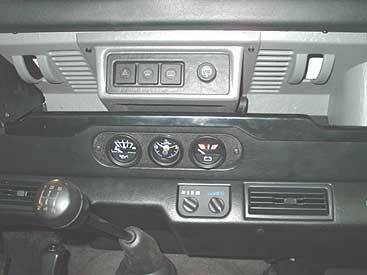 In the center dash of the 110 you can see the relocated systems. All the controls and features of a standard NAS 110 are here, they are just arranged differently. 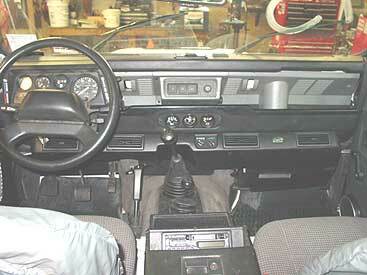 All 3 gauges reside in the lower dash area and work as normal. 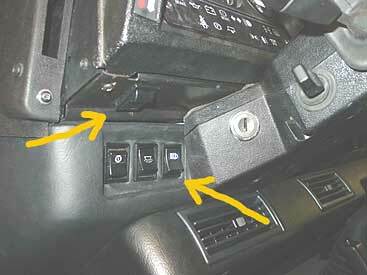 The controls for the hazard lights and defrosters are mounted on a factory looking panel in the middle of the dash, as are the 12v power point and the rear wipe/wash control. 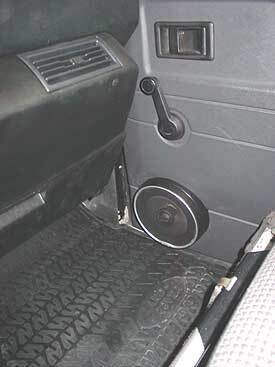 The new AC controls are located just below the gauges and the fan and heater controls are now located in the factory Defender 90 positions at the drivers finger tips. This image shows the completed conversion. 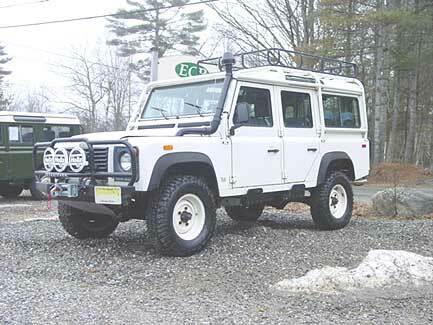 It is a very clean and stock looking way to get rid of the troublesome and inefficient 1993 NAS 110 HVAC system and it adds performance and longevity to the Defender. 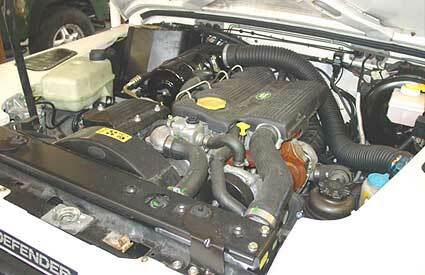 Above you can see a shot of the completed 300 Tdi, NAS 110 engine bay. We'll let that one speak for itself. 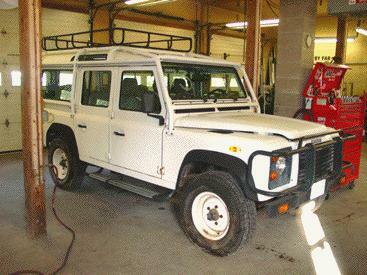 Here you can see the 1993 NAS Defender 110, now complete and ready for transport back to NJ. The 110 Wagon is now the definition of most Rover lovers dreams: Galvanized chassis, Stage II suspension, ARB air lockers, ECR ROX guards, a new HVAC system and much more. If you have big dreams for your Defender contact ECR. We can make all your Defender dreams come true.